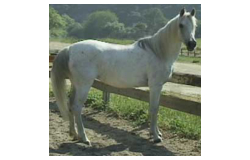 Dancin’s dam, Silver Star, is a lovely mare who was bred by Richard Skinner, manager of the Hearst Ranch for many years. It would stand to reason that he would breed such a beautiful and elegant moving mare. This is her second foal -- this time by Hal’s Riverdance. As you can see, the combination produced a gorgeous wide set eyed beauty who could really move. Click on her name above to see her athletic pedigree . Click on her sire and dam’s names for their videos.